That’s right, it’s an advertisement – for an entirely different EA game. Even before you make it to the ad-laden main menu or even the title screen with a giant “connect to Facebook” button, the player has to get through an ad with the intention of taking them out of the game. While I’m sure it didn’t hurt the sales of Need for Speed Most Wanted, it’s definitely not a great way to get players excited about the game they just downloaded. So this one was at least for the game that I started to play, and didn’t try to actively direct me out of the app. I appreciate that, I guess. However, being the second time I tried playing the game, I have no idea what on earth they are talking about in this ad. 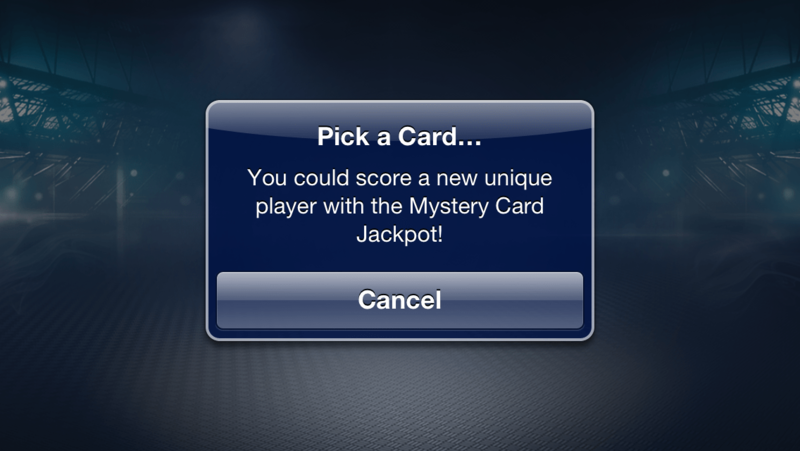 The only thing vaguely like a call to action here is “Pick a Card…”. Maybe this would mean something to a seasoned player, but it sure didn’t to me. If you’re insisting on flooding your users with ads on launch of your game, at least make them reasonably good. A study of app downloads in 2010 showed that 26% of downloaded apps were used just once. It’s been a few years since 2010, and the mobile game ecosystem has changed significantly, so that stat probably isn’t valid anymore. But the point remains – there are so many other distractions for users on mobile devices, a game has to really engage the person in a hurry. Personally, most definitely I’ve even paid money for games that I haven’t opened once (also yes, I may have a problem). First impressions are massively important. Malcolm Gladwell’s book “Blink” is (awesome, and) all about the power of making snap judgements, and how important the first few moments of an interaction are. And when the first thing your app tells me to do is to go play another game? That’s probably what’s going to happen – I’m going to go do something else. Perhaps unsurprisingly, Madden NFL 13 Social never really took off, and is scheduled to be retired in September 2013, less than a year after its release. So I’m sure there are other freemium titles out there that have ridiculous advertising schemes – I know plenty of games have rewards for downloading other games by the same developer. What other slimy tactics have you seen games take on first launch? This entry was posted in Browser, Casual, Mobile, Sports and tagged casual games, ea, facebook, game design, game experience, game usability, ios, madden, ux by mark d. Bookmark the permalink.